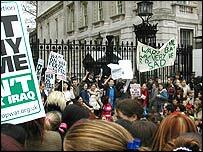 Thousands of children have walked out of their schools across Britain to stage anti-war demonstrations. There were protests in London, Birmingham, Leeds, Sheffield, Liverpool, Cambridge and Milton Keynes. About 60 children left Fortismere school in North London at break time on Wednesday and marched to Westminster. More than 200 children - some as young as 13 - are protesting outside the Houses of Parliament. The demonstration was organised by young members of the Stop the War Coalition. In Birmingham, about 350 pupils from Queensbridge School walked out to take part in a march in the city centre with students. The organiser of the Fortismere School walk out is sixth-former Sam Beste. He told BBC News Online: "We just walked out of the school at break-time. "There are now about 60 of us from our school. More would have come, but the teachers locked the gates after we left. "We are against the war and this is the next step in our campaign to raise our voices against the war." "They have whipped up a frenzy over this and will be in a lot of trouble when they get back. Whoever organised this across the schools was fantastically irresponsible. " The demonstrations were timed to coincide with student anti-war demonstrations called "Books not bombs" expected to take place in the United States on Wednesday. 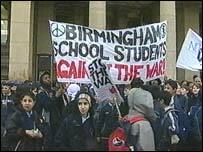 The Stop the War Coalition say children from many other schools across London also staged walk-outs. They put the number of children in Whitehall at about 500, with other big demonstrations in Birmingham, Sheffield, Liverpool and Milton Keynes. A spokesman said: "What they have done is brilliant. They are worried about what is happening, that the government is going to war against the wishes of the people." Among the crowd in Westminster was Chris Smith, 17, who goes to school in New Malden. He said there was no justification for a war and accused America of hypocrisy after its previous support of Iraq against Iran. Asked what he hoped to achieve by protesting, he added: "There is no good sitting in front of your television if something like this is going on - you have to get up and do something." One 15 year old from William Ellis School in Highgate, who would not give his name, said: "From everything I heard war is unnecessary to do what they want to do - there are other ways of achieving their aims." In Birmingham, the head teacher of Queensbridge School Christine Pitt wrote to parents warning them that the protest was not being sanctioned by the school. She wrote: "Students who stay off to be part of the protest will be marked with an unauthorised absence and have been instructed that they must have your permission in order to participate." 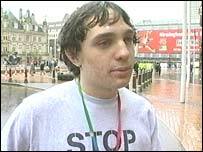 Among those taking part in the Birmingham protest was Jacob Hunt Stewart, 14, whose father is health minister Lord Hunt. Jacob said the government was ignoring the views of young people. "My dad, as health minister, follows the government line, but he believes that I am mature enough to make my own decision as to whether I want to take part in a protest. "We are concerned about what will happen to people in Iraq if there is a war, especially the children. "Many people will be killed in Iraq if there is a war." In Leeds, two boys were suspended form Prince Henry's Grammar School because the head teacher said they were inciting others to walk out. "They are determined to show that resistance is blooming among the next generation of voters"